Thank you to everyone who played along with our challenge this week. Once again there were amazingly creative submissions in the gallery. We love seeing what you do with our challenges and inspiring us. 1. Hannelie's choice: Diana's beautiful wreath is the perfect focal point for the sketch! Great design! 2. LeAnne's Choice: Maria's awesome birthday card really revs up the fun! Love the background! 3. Sandy: Lori's cute little mouse with his bushel of apples made me smile! So perfectly colored, too! 5. Joanne's Choice: Jan uses acetate to great effect on this rich and elegant card - gorgeous! 7. Linda's Choice: I love how Deborah flipped the sketch and created a one layer card with her images! 8. Laurie's choice: Lori's black and white card is SO striking! Congratulations! 9. Nance's choice: Lisa's card is a perfect blend of rustic elements and clean design--fabulous card! I fell in love with Claire's little NYC kitty the minute I saw it in the gallery and just kept coming back to it. 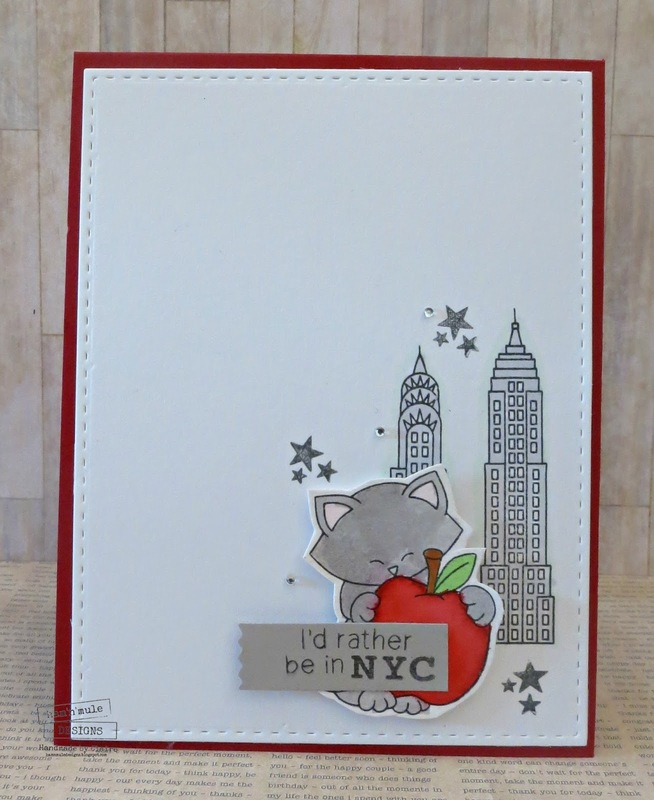 I loved the skyscrapers that Claire used for the vertical element and the placement of the stars around them really helped draw the eye to that fabulous little kitty. The muted color scheme really allowed the apple to shine proud and jump from the page. Fabulous card. Congratulations, Claire, you are my HEADLINER for this week. Thank you to everyone for playing along with us! Congratulations to all our winners, please pick up your badges here. Be sure to come back tomorrow for a bonus Tic-Tac-Toe challenge from LeAnne! Thank you Claire for choosing my card this week!!! All the entries were fabulous! Congrats everyone! I look forward to playing along tomorrow! Congrats to Claire and the other Cut Above picks. Thank you Colleen for picking my card.